A number of examples (10-14) of the basic type have been found in Britain. An interesting peculiarity of their distribution is that they are found mainly in the south west and south central England. Distribution further east is rare and largely grouped around the Chilterns and Icknield Way area, although a very small number of examples have been found further north. Their distribution raises interesting questions about the presence of different troops in different regions. 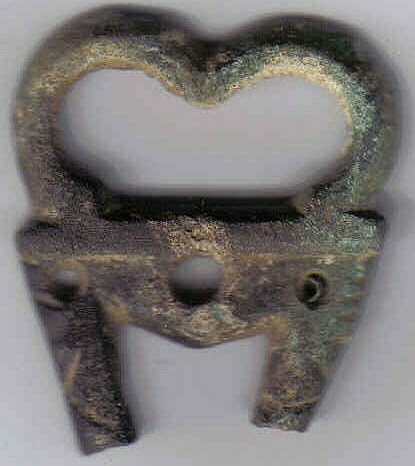 Could the presence of these buckles in the south and west, but rarely in the east and north, represent some kind of military division, perhaps even military confrontation? The centre of the grouping seems to be somewhere in the area where the Thames cuts the Chilterns, which was an area of inter-tribal tension in pre-Roman times. 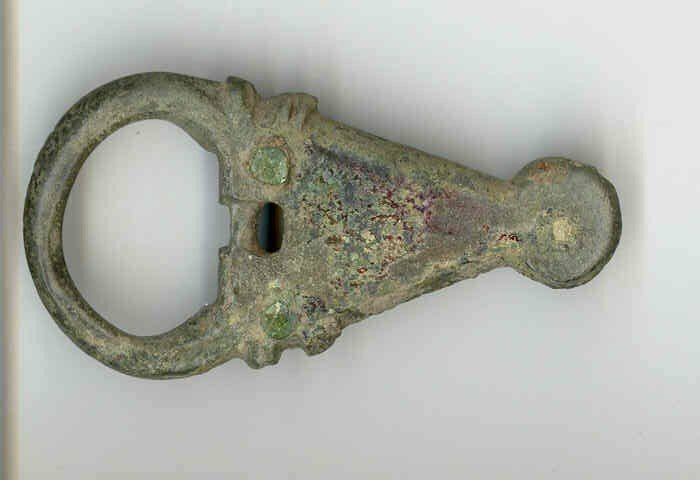 It also sees militarization at the end of the Roman period, with the heavy fortification of Mildenhall, the presence of a ballista platform at Dorchester on Thames and, a relatively rare this far inland, appearance of chip carved military belt furniture in a grave there. A rare variation of the basic type features a kidney shaped loop instead of a rounded loop (5, 6, 7). 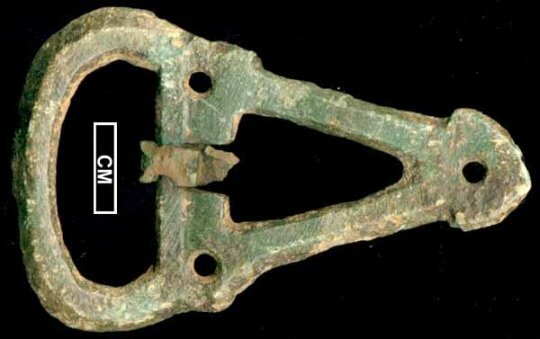 Kidney shaped loops on buckles are not uncommon on the continent, but do seem rare on triangular plate buckles. Two of these are known form Britain. I?m only aware of one from the continent, from Furfooz in Belgium (7). 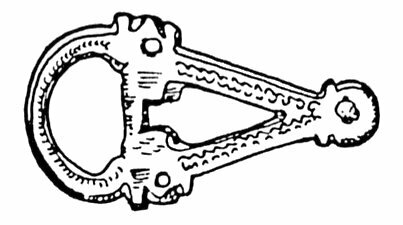 Equally 6 has intricate decoration on its triangular frame, which (see 12, 13) only seems to occur on British triangular plate buckles. 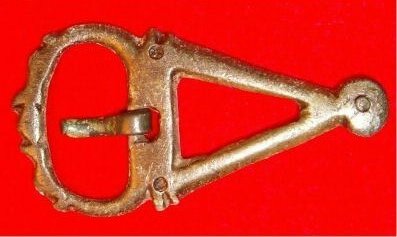 All of which means that it is possible the Triangular Plate and Kidney Loop buckles are a British variation and the Furfooz example is an export, or at least, in British style. 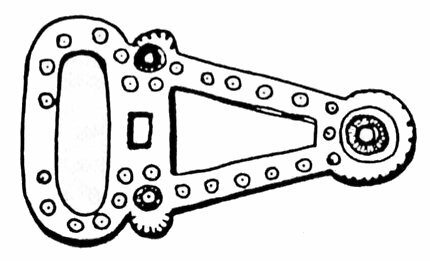 Where Triangular Plate buckles are found further from their geographical centre, there appears to be a tendency for their form to be subject to more change. 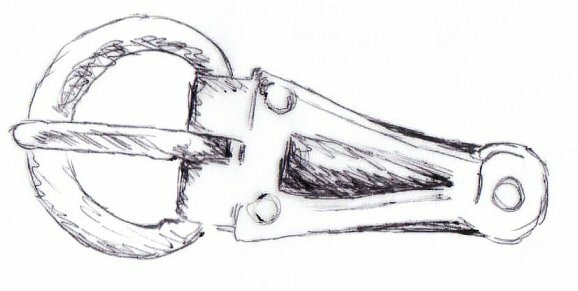 (kidney shaped loops and the dolphin triangular plate buckles, for instance, both appear on the edges of the main grouping.) This could also be a chronological effect, with more changes happening in later buckles. 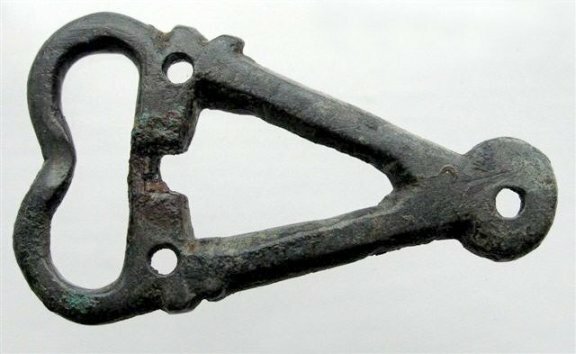 It has been argued that the latest Roman British triangular buckles could be the precursors of the Anglo-Saxon triangular buckles. 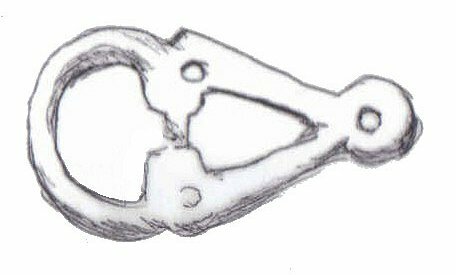 This is possible, and certainly some British buckles with their flatter loops (10, 11) begin to look more like Anglo-Saxon types, and the Enfield buckle (12) does look quite like a ?missing link? 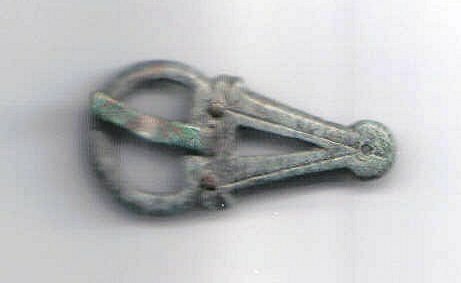 between Roman British and Anglo-Saxon triangular types. 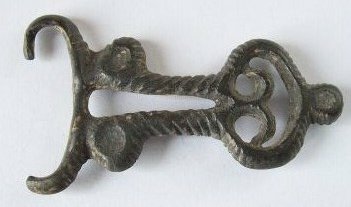 In the absence of other Enfield type buckles, however, it is hard to be sure, and it is equally possible that the transition to the later Germanic buckles occurs on the continent and is then imported into England via the well-developed contacts between the Franks and Kent. 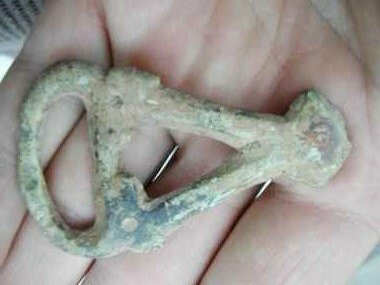 For another (probably continental) ?missing link? (see 14).